I’ve been housing my bullet journal in a beautiful traveler’s notebook (TN for short) cover for awhile now and absolutely love the setup. I decided to take some time to customize my new Chic Sparrow TN from cover to cover to make it more “me.” I covered my notebooks in pretty paper and added decorative bits and bobs here and there. I absolutely love how it turned out! I hope you enjoyed seeing how I decked out my TN. I use it everyday since it houses my bullet journal and it brings me such joy to see these new little touches. It’s the little things, you know? 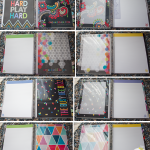 I’d love to know how you personalize your planners and journals if you care to share! Jen!!! You have SO MUCH TALENT!!! You are so inspiring to me. So glad you share your life with us. 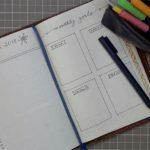 Hi Jen, I just got done reading about plum planner vs erin condren’s ….I love this travelers notebook and I can’t find it, can you please email me and let me know if there is a similar one like this? christina4733@aol.com I would appreciate it. thank you.